Plus, you wont have to go hunting for power sockets! Tommy Walsh loves his Power8 and so will you! 1 x POWERhandles (wiith 18v 2.6 Ah li-ion lithium battery). The Worlds First Portable Compact Cordless Workstation! 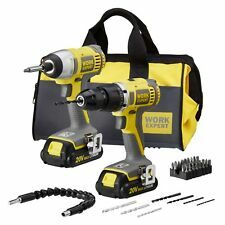 DeWalt XR 1.3Ah Li-ion Hammer drill driver & impact driver 2 batteries DCZ298C2. 5 out of 5 stars - DeWalt XR 1.3Ah Li-ion Hammer drill driver & impact driver 2 batteries DCZ298C2. 5 product ratings5 product ratings - DeWalt XR 1.3Ah Li-ion Hammer drill driver & impact driver 2 batteries DCZ298C2. 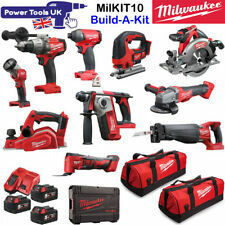 Milwaukee caulking gun set. Condition is New. GMC Pt No. 436020. Combi drill features. Condition: An Ex-demonstration item which has been used for demonstration or display purposes and may show signs of wear. Fully checked and in excellent working order. The Einhell TE-TK 18 Li Drill & Grinder Kit, contains the following TE-TK 18 Li Drill & Grinder Kit 18V 1 x 1.5Ah & 1 x 3.0Ah Li-ion. 1 x 18 Volt TE-AG 18 Li Power X-Change Angle Grinder is a very handy, compact tool and is the lightest angle grinder of its class.